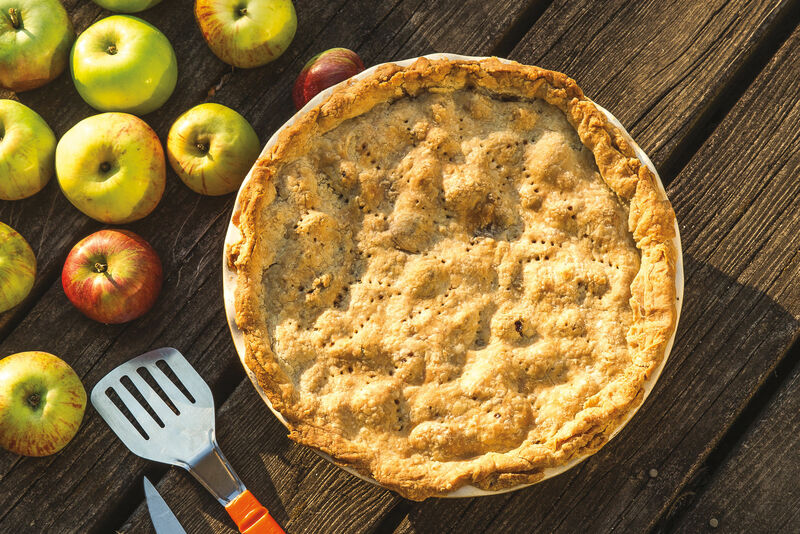 Two Tarts Bakery teaches us to wrap up the local harvest in delicious crescent cookies. WHEN MOST of us crave desserts, we conjure rich buttercreams, sweet pastries, and deep, dark chocolate. 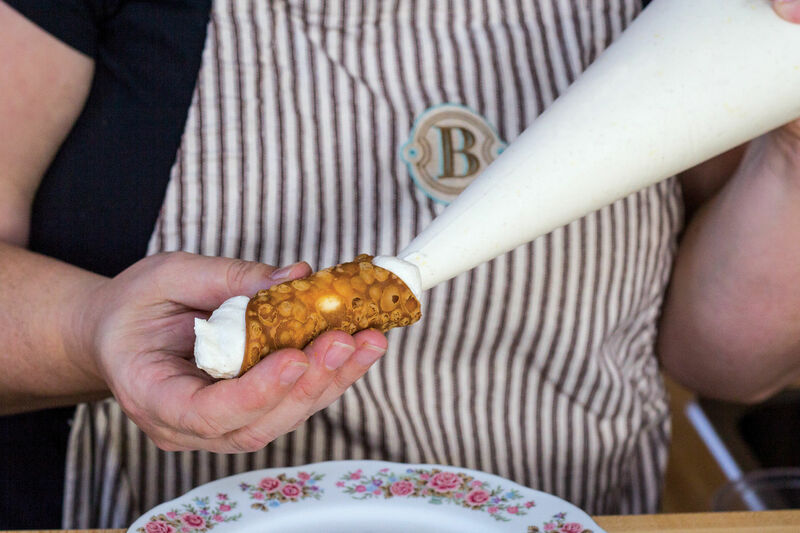 But surrounded by this sort of indulgent, bite-size sweetness all day long, Elizabeth Beekley, owner of Northwest Portland’s Two Tarts Bakery, prefers an alternative—something bright and puckery that can hold its own against an onslaught of sugar. Like rhubarb. “It’s so exciting for us,” says Beekley, who’s smitten with the spring crop, “the first local fruit of the year.” Two Tarts has even hosted all-rhubarb baking classes, where aspiring bakers turn out crumbly bars layered with rhubarb preserves, little gem cookies filled with a tart dollop, and one of Beekley’s personal favorites, rhubarb rugelach. Rugelach, the hard-to-find Eastern European crescent cookies, are usually filled with a spread of jam and a smattering of nuts or chocolate—or both. For her version, Beekley forsakes premade preserves, instead opting to take advantage of rhubarb’s willingness to slump under heat and simmer down into a quick reduction. 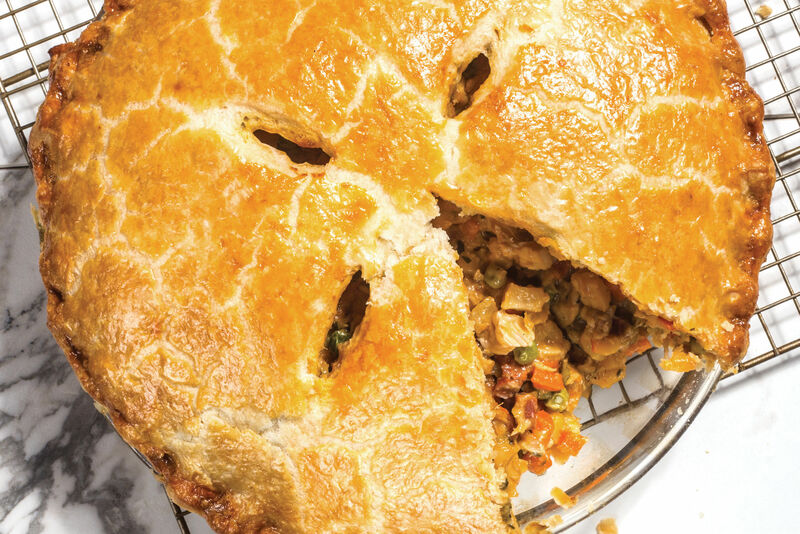 She spikes it with a very un-European jolt of star anise—“I really like a tiny bit of that spice with the tartness”—and then rolls it with a shower of almonds in a rich cream cheese dough, the bright flavor of rhubarb playing against the rich, buttery pastry. Beekley concedes that rhubarb does tend to elicit a strong response, whether adoration or abhorrence. “There’s nobody in between—it’s a really polarizing fruit,” she says. 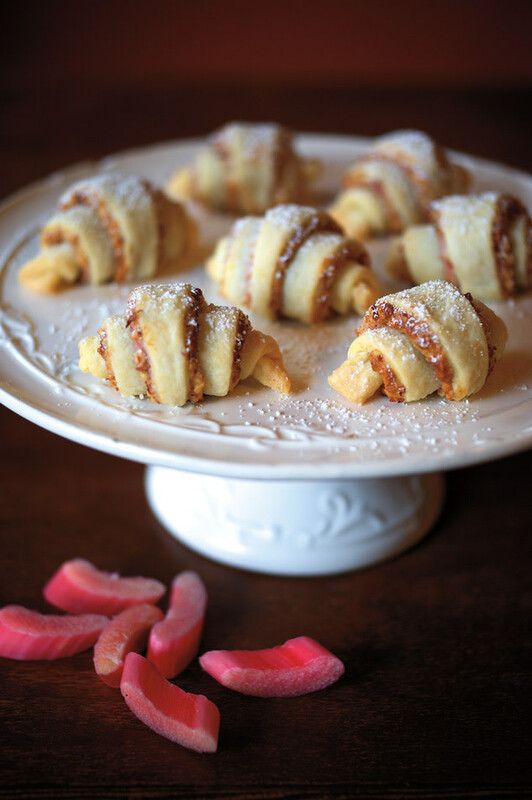 But with rugelach like these, Team Rhubarb might win over a few more converts. (1) IN a standing mixer fitted with a paddle attachment, cream butter, cream cheese, lemon zest, and vanilla until soft. (2) ADD flour and mix until well incorporated. (3) REMOVE dough and divide into 2 pieces. (4) FLATTEN into discs, wrap in parchment paper, and chill until firm (at least 1 hour). (1) IN a nonreactive saucepan (clay, enamel, or stainless steel), mix the remaining ingredients together and stew over low heat, stirring occasionally. (2) COOK until rhubarb has completely dissolved and the mixture has thickened (1–2 hours). (3) REMOVE star anise and vanilla bean, and cool. (4) COMBINE 1 cup rhubarb mixture with nuts and cinnamon in a small bowl, and stir until pasty in consistency. (1)PREHEAT oven to 350 degrees. (2) ROLL out each disc of rugelach on a flour-dusted surface into a circle approximately 12 inches in diameter. (3) SPREAD half the rhubarb filling mixture to within an inch of each circle’s edge. (4) CUT each circle in half along the diameter, then in half again, and so on, until you have 16 even wedges per circle. (5) STARTING with the fat end of each wedge, roll into a crescent shape. (6) PLACE point-side down on a parchment-lined baking pan. (7) BAKE until light golden in color, approximately 15–20 minutes. (8) REMOVE from oven, cool, and dust with powdered sugar.